If you're looking for the next epic side dish for your upcoming barbecue or picnic, here you go. 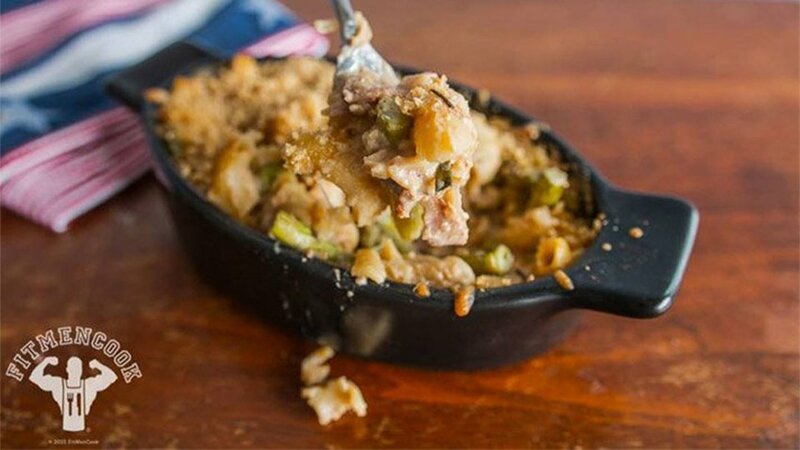 This healthy take on a classic comfort food takes things up a notch, since it's baked on a wood-pellet grill like a Traeger. Stick it on the grill right beside your meat and veggies, then sit back and enjoy epic grilling at its finest. I guarantee, this crowd pleaser will make you the life of the party. Set your grill to 350 degrees F.
Cook the pasta according to the instructions provided on the package and set aside. Spray a nonstick skillet with coconut oil and warm it to medium-high heat. Cook garlic, red onions, and bacon together in the skillet for about 4 minutes, or until the red onions turn brown and the edges of the bacon are crispy. Stir in chicken broth, flour, Greek yogurt, and goat cheese, and allow the sauce to simmer momentarily. Mix in cooked pasta, chopped asparagus, and fresh rosemary. Stir thoroughly, then remove from the heat. Pour the contents into a baking dish. I used mini cast-iron dishes in order to better measure out individual portion sizes. Top with mozzarella and panko crumbs. Bake for at least 20 minutes, or until the bread crumbs have turned brown.